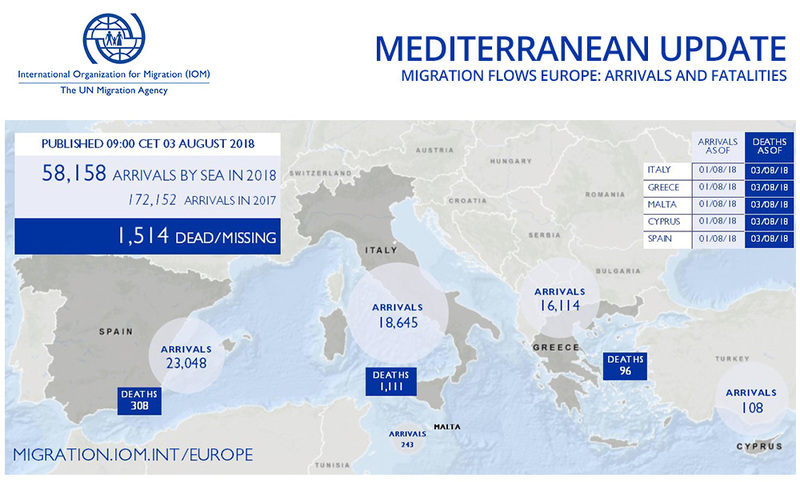 Arrivals to Spain (see chart below) in July overtook those to Italy and have surpassed the total number of arrivals (22,108) recorded in Spanish waters during all of 2017. This year almost 40 per cent of all Mediterranean irregular migrants have come via the Western Mediterranean route, whose irregular migration volume has more than tripled that registered on the route by this time last year. As remarkable as Spain’s rise in irregular migration activity has been through 2018, more significant is this summer surge. Over the year’s first five months, a total of 8,150 men, women and children were rescued in Spanish waters after leaving Africa – an average of 54 per day. In the 62 days since May 31, a total of 14,898 have arrived – or over 240 migrants per day (see chart below). The Western route also extremely deadly, with over 300 fatalities recorded through 1 August – a nearly 50 per cent increase over all of last year’s total: 224. Most recently, IOM’s Missing Migrant Project recorded a young man drowned off the coast of Tangiers, Morocco on 30 July. He was travelling with two other friends on a small inflatable raft when it capsized off Achakkar, near Tangiers. The two friends survived and were taken by local civil protection authorities to the hospital. IOM Athens’ Antigoni Avgeropoulou said Thursday that in the three days from 30 July through 1 August, the Hellenic Coast Guard (HCG) reported at least two incidents requiring search and rescue operations off the islands of Kos and Samos. The HCG rescued a total of 55 migrants and transferred them to those respective islands. Additionally, arrivals to Rhodes and Lesvos this week bring the total number of sea arrivals to Greek territory since 1 January to 16,114. IOM’s Ivona Zakoska reported that arrivals to Bosnia and Herzegovina between January and end of July 2018 reached a total of 10,023, ten times more than the 1,116 reported for the whole of 2017. One third of all registered migrants were of Pakistani origin, followed by 16 per cent of those who declared Syrian nationality and 13 per cent of those who declared Iranian origin. According to the information received from IOM field staff present in Bosnia and Herzegovina, there are an estimated 4,500 migrants present in the country, mainly in Velika Kladusa (Una Sana canton) close to the border with Croatia. IOM is supporting the Government to increase the accommodation capacities of the official reception centres in the country by refurbishing and preparing the infrastructure to add additional 1,200 places to the existing capacity which is currently less than 600. Increase in arrivals has been observed also in Albania and Montenegro. An estimated 1,358 irregular migrants attempting to cross the Albanian-Greek border were registered in Albania so far this year, four times the 354 reported in the same period in 2016 and almost ten times more than the 178 reported between January and July 2017. Moreover, arrivals to Albania at the end of July 2018 exceeded the 752 registered in the whole of 2017. More than half of migrants who arrived this year are from Syrian Arab Republic (55%). Pakistani (10%), Iraqi (8%), Algerian (6%) and Moroccan (5%) are the remaining nationalities registered among the top five nationality groups this year. Similar nationality breakdown is registered also among the 740 migrants who are apprehended on exit from Albania to Montenegro (top five nationalities – 43% Syrian, 25% Pakistani, 7% Iraqi, 4% Libyan and 3% Palestinian). In Montenegro, authorities registered 2,473 arrivals between January and July 2018, ten times more than 266 registered in the same period last year and 20 times more than 125 reported at the end of July 2016. Further on, arrivals this year are already triple the 807 registered in the whole of 2017. As in Albania, Syrian Arab Republic is the first registered nationality in Montenegro this year (42%), followed by migrants from Pakistan (18%), Algeria (11%), Iraq (8%), Morocco (6%) and Libya (4%). Worldwide, IOM’s Missing Migrants Project has documented the deaths of 2,332 people during migration to international destinations in 2018 (see chart below). In Europe, the remains of a 14-year-old boy were recovered by Greek authorities from the Evros river on the Greece-Turkey border on 29 July. According to a forensic expert, it is likely the boy died three months before. In Serbia, two migrants were shot near the town of Dobrinci, 45km northwest of Belgrade, on 1 August, according to Serbian police. On the US-Mexico border, the remains of five migrants were recovered in the last few days, two of them in Texas and three in California. On 21 July, the remains of a 27-year-old woman from Guatemala were retrieved near Laredo, Texas. According to her family, she left her hometown in Guatemala’s department of Sololá in late May, with the aim of crossing the border into the US. The last time they heard from her was on 7 July, the day she left Mexico to cross the border. Additionally, remains of a young man from El Salvador were found in an irrigation canal in El Paso County, Texas on 30 July. In California, remains of three migrants were retrieved over a period of four days last month. One young man died of dehydration after crossing the US-Mexico border near Calexico. His remains were recovered in a remote area on 21 July. Three days later (24 July), the remains of another migrant were found in a ranch in Imperial County, California. On 25 July, US Border Patrol officers found the body of the third migrant 17km east of the USBP East Port of Entry in Calexico, California.